· G-Sensor Mode and Night Navigation Lights — Allows the small quadcopter to automatically follow the way the smartphone moves; Production Description; LED adoption allows you to recognize the direction of flight in a dark night. 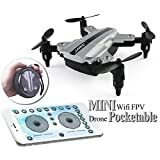 · WIFI FPV Camera Super Wide Angle Shooting - WiFi Mobile Control The Drone with 720P HD camera allows you to take satisfying selfies and enjoy the fascinating panoramic view. The 50 m control distance gives you a stunning bird´s eye view. · Altitude Standby Mode and Headless Mode — The drone quadcopter will still move over height when using an altitude retention mode, you can perform steady and steady steady steady flights and deliver aerial photographs; In headless mode, the drone flies in the direction you want even if you don´t know its orientation. · Voice Control Mode - Imagine you´re like an artist with a smooth tone, the drone will obey your arrangement as long as you order it. Forward, backward, left/right, sideways, take off, land — More dominant!! !